Yesterday I did a new celebrity caricature for our most recent major loss to the entertainment industry: David Bowie. I'm especially bothered that he was only 69 years old. That's only 18 years older than I am. And he was in much better shape than me--although his early years may have taken their toll. He was a wild one! I was only a marginal fan of his music, although there were songs of his that I really loved. I was more a fan of him as not just an artist, but a work of art himself! He was a chameleon and a magician with his own image, making damn good art, with David Bowie as the subject and the medium. 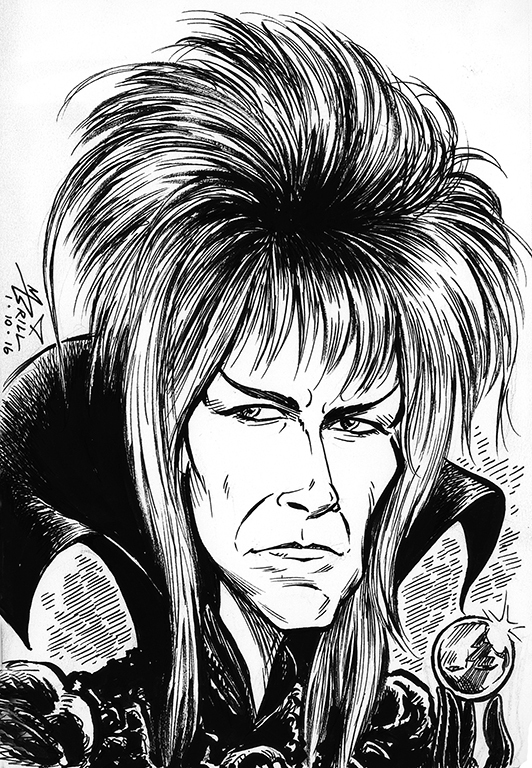 Anyway, here is the caricature I did of him as one of my favorite characters he presented to us, although this one was a movie persona and not entirely his own creation--Jareth, the Goblin King! I may color this and add a background. Or I may have to make a cool full length version! It is an amazing movie and he was excellent as the twisted King of the denizens of the Labyrinth! He worked surprisingly well with puppets. Anyway, thanks for the memories and the music, Mr. Stardust! First Night -- Last Caricature Gig of 2015!